I would like to take this opportunity to say THANK-YOU for the season that was the 2014-15 season. I am sad to see the season end BUT I am in NO way disappointed with the team or what you gave THIS city. You gave us an incredible season from start to finish. You allowed us to move on from the shadows of last season and build hope for the future of this franchise. You showed this city and the entire league that you could compete with the elite teams despite what the odds said. You allowed this city to dream of what could be and what one day WILL be. This season had many ups, downs and twists along the way that led the team to a bounce back season. You brought back Captain Canuck when you named, Trevor Linden as the new president of hockey operations. The Sedins proved all the naysayers wrong YET again as they always do. Your off-season signings of Radim Vrbata and Ryan Miller proved to be exactly what the doctor ordered despite what the critics presumed prior to the season’s start. Perhaps neither of those signings seemed too massive to the outsiders looking in, but each player found a way to make their indelible mark on the team in their first season as Canucks. You found a coach that believed not only in each individual player but in the team as a whole when you named, Willie Desjardins as coach. Players that struggled last year rediscovered what they lost last season…confidence that made the game fun. You showed this city that a little belief from the coach and in each other can go a long way towards having success. You may not have had a perfect season but you gave this city many incredible memories from Daniel’s 1000th game, to Henrik’s 900th point to Millsy’s back to back shutouts on the road, to a massively improved shootout record to the farm team becoming an integral part of the franchise…there are ENDLESS things to be proud of from this season. Perhaps though my most favourite memories from this season are my own personal memories. 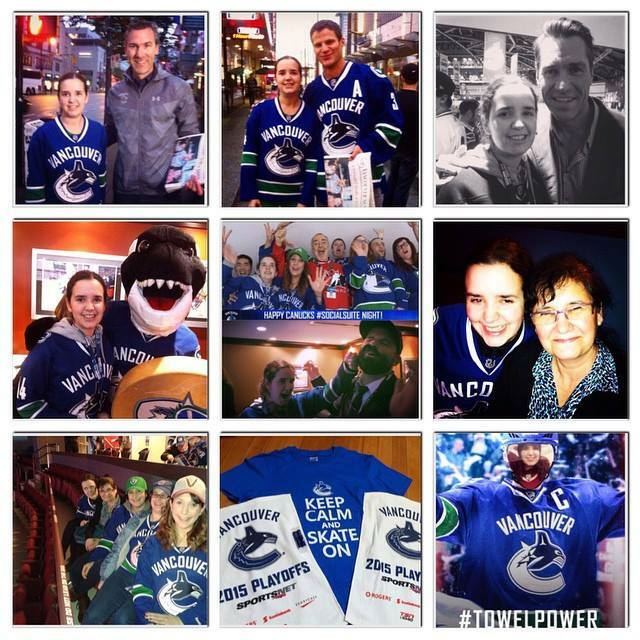 From meeting Trevor Linden, Kevin Bieksa, Kirk McLean to being invited to taking part in the Canucks #SocialSuite night or that time I punched Johnny Canuck to attending a MASSIVE birthday win versus the Maple Leafs to getting be one of the lucky fans that got to have even for one round a post-season dream. So do I wish that the Canucks were still in the hunt for the Stanley Cup? Absolutely, but as I previously stated, I am in NO way disappointed in the season they gave this city. There is only an incredibly grateful heart over here for the season that was. I loved every up, every down and every twist in between this season. It may not have been a perfect season from start to finish but no season ever is completely perfect.I will take a perfectly imperfect season because in each imperfection grows even stronger the dream of what one day WILL be. Yes, this year the dream fell short but it did not dimmer the hope for the future. So thank-you for this season in which you re-engaged this city and re-ignited the dream. Your future still burns bright and I look forward whatever that holds moving forward. 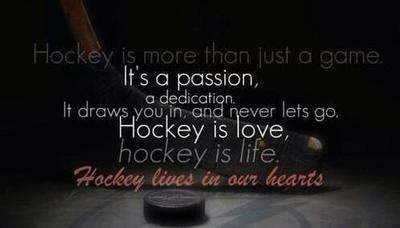 I was yesterday, am now and always will be a Vancouver Canucks fan. Playoff fever, is that YOU calling my name? YES, it is! The Vancouver Canucks have officially punched their 2015 playoff ticket! There were many who said after the torpedo that was last season, that were beyond skeptical that the Canucks could return to the post-season THIS year. What a difference, a year can make! Last year when Trevor Linden said that THIS team was going to make it to the playoffs, there were A LOT of doubters. How could anyone blame them after what was the Torts era? Many “experts” were certain that the Canucks would not be playoff bound THIS season and would stuck in rebuild mode for some time. Linden never said it was going to be easy for them to get there, but he did say they would try to make the team remember why they love the game and get a little tenacity back in their game. He has done just that. Was the season perfect from start to finish? No, not at all but it sure was refreshing to watch this team come together rather than fall apart at the seams. This year was supposed to be about rebuilding rather than exceeding expectations. This year, the Sedins were supposed to be washed up, secondary scoring was a pipe dream and goal-tending was a question mark at best. This year the Canucks were supposed to be part of the Connor McDavid sweepstakes. This year in the hands of a newly minted team president, newly minted GM and newly minted head coach was a gamble. Well long story short, the Canucks took that gamble on that newly minted trio and they surprised a lot of people around the league with their success. Trevor Linden wanted to bring back excitement to the Canucks on ice product and he has done just that and more this season. He brought in a scouting and development expert in GM Jim Benning and a coach who brings out the best in his players in Willie Desjardins. All three of them have been invested from the start in not only working with the current roster but also with their players on their AHL roster in Utica and their younger prospects still playing junior. From top to bottom of this organization, this management group has been involved to turn things around and continue building for the future. The players came in knowing that last year was disastrous and determined to prove everyone wrong who said they were going to be bottom feeders and more than that they could still be competitive with the league’s top teams. More than that, the dynamic in the room had changed not only with new management but also with new players on the roster. Change was needed not just internally but also in the game that they played as a team EACH game. Consistency and cohesiveness was needed. Time would tell just serious this team was about moving forward from last season’s tornado. The Sedins may not be on a point-per-game pace this season, but they are back to playing the way that proves they are still exciting to watch making dazzling plays on a nightly basis. They have both surpassed their point totals of last season and lately have been absolutely clutch when called upon (ahem, that TYING goal vs. LA anyone?). Henrik and Daniel have flourished under Desjardins in a way that did not happen with Torts. Last year between Torts and injuries, they seemed to lose their confidence, whereas this year they seem to have found that spark again. It never ceases to amaze me, the way those two work together with seamless no look passes and impossible angle goals. It’s no secret that Alex Burrows struggled under Torts and was also low in the confidence department. This year, he made it clear that he did not care which line he played on as long he as he got to play, he would do whatever coach asked of him. Desjardins has played Burrows on nearly every line and in every situation (5-on-5, 5-on-4, 4-on-4 and 5-on-3) and he has been reliable adapting to each situation. He may not be breaking any records, but he is finding a way to contribute no matter which line or situation he’s asked to play. It sure is amazing what a little belief and confidence from the coach can make in the way a player plays from start to finish in a season. Radim Vrbata easily became one of the best 2014 off-season signings! He is everything that Jim Benning expected and more! His 31 goals and counting is a team high and he is money in the bank when it comes to the not-so-dreaded shootout. It does not matter which line he plays on, he adds an offensive spark nearly every game. His consistency on the scoreboard has helped to take the pressure off of the Sedins and provide much needed secondary scoring. And yes goal-tending was a fiasco after the Luongo and Schneider trades leaving people to wonder if Lack could carry the load or if a veteran would need to come in to solidify the crease. The truth is BOTH of those things happened. In the summer Linden and Benning signed veteran goalie, Ryan Miller to solidify the crease and be a mentor to Eddie Lack. Miller has been everything as advertised, having a stellar season posting six shutouts while maintaining a Canucks playoff position prior to his injury. Miller’s injury forced Eddie Lack into the reigns down the stretch and he stood up to the challenge helping to keep the Canucks in their season-long playoff position. Together these two have done exactly what they were asked to do from the start despite the doubts that outsiders projected at them. For the playoffs, no matter which one is in the crease, they BOTH deserve credit for helping get the Canucks this far. It was NO easy task for Trevor Linden to come in and turn this team around in a year since taking over as President of Hockey operations. He did what seemed to many impossible: made the Vancouver Canucks believe that they were competitive and translated that to them BEING competitive more nights than not. He found the right GM and the right coach to help the team forward and change the mindset from last season’s disaster to this year’s success. Trevor Linden said that change was coming and that the team would be playoff bound come April. Change came and the team IS playoff bound. Linden and company delivered on their promises and never wavered from their desire to see the team succeed. Eighty games down, two remain with an opportunity to clinch home ice in the opening round of the 2015 NHL playoffs. Are you ready, Vancouver? That noise you hear is PLAYOFF FEVER calling your name! Get those jerseys, white towels, flags and playoff gear ready for April 15th! The best part of the NHL season is nearly upon us! Change is coming, change IS here. Did you believe that statement would be true prior to the start of the season? It truly is incredible to witness what the Vancouver Canucks have accomplished this season. Yes, it is true, that it is not a record breaking year and from the outside looking in, it might seem hardly remarkable. This season was supposed to be a season focused on rebuilding following the disaster that was the 2013-14 regular season or at least that’s what the media told us. And after the season that was last year, who could blame them for thinking that is what comes next? Just who are these Vancouver Canucks?! These are the Canucks brought to you by, former captain Trevor Linden. Along with Linden for the ride is GM Jim Benning and newly minted head coach, Willie Desjardins. The trio was determined to turn things around THIS season while at the same time building for the future. They may not be winning every game or necessarily the games that people would expect them to, but they are finding ways to be competitive more nights than not. They have maintained a playoff position for most of the season and continue to be in a competitive race for a second place finish in the Pacific Division with 90 points and eight games remaining still to be played. Through 74 games, Desjardins has coached the team to a 43-27-4 record. The odds unlike last season, are actually in their favour heading down the stretch drive to the post season. “Reunited and it feels SO good…”! The Sedins may not be quite a point-per-game pace but they certainly are looking more and more like the dependable players that they were before the 2013-14 NHL season. In true twin fashion, they are tied for the team lead in points each with 66, the only difference being that HENRIK has one more goal and DANIEL has one more assist. Goal-tending was also an area that team WilLindEnning addressed this summer with the signing of veteran goalie, Ryan Miller. Many questioned whether he would fit with the Canucks and what this would mean for Eddie Lack. Millsy had a resilient season picking up 28 wins that included 6 shutouts prior to an injury in late February. He’s a massive reason as to why the Canucks have been able to maintain their playoff position all season long. Since the injury to Miller, Eddie Lack has stepped up to fill in and raised his level of play and helped the Canucks stay in the playoff hunt. Does this mean Lack is the number one now or that Millsy gets back the net come playoff time? To be honest, I do not care WHO is in the net, just that they play to the best of their abilities when they are in the crease. Do we need another goal-tender controversy in Vancouver? Say it with me, NO! We do not need to create another controversy among the goalies and this city. It would simply be incredible if down this stretch and however far this team goes into the playoffs that THIS city would SUPPORT whichever goalie is in the net. Jim Benning also did the seemingly impossible by locking down Christopher Tanev for five more seasons much to the delight of Canucks fans. Tanev has proven to be an integral part of the defensive core with ever growing potential. He’s often a goalie’s best friend on the blue line making crucial blocks and the odd game-saving goal-line save. It was paramount to get his deal done before season’s end or the free agency frenzy. Well done, Jim, well done. Most surprising of all this season is that despite a depleted lineup during January and February, the team was still finding ways to be competitive and win games. 74 games down, 8 to go. 15 spots remain to be claimed in the Stanley Cup playoffs. Will the Canucks clinch a spot down the stretch? That remains to be seen, but unlike last season, the odds are not down to a long shot but simply solid play in the games that remain. Are you ready for what these last 8 games will reveal? Regardless of how it ends, it sure has been exhilarating to witness this team find a little bit of its tenacity once more. This team is playoff dreaming once again. Slowly but surely, Trevor Linden has this team turning this city into BO-lievers and despite the odds on paper at the start, anything is possible. MARCH MADNESS is in full swing around the NHL from intense playoff drives, to playing with jobs on the line for next season, to playing spoiler, there is no shortage of dramatics around the league. Expectations will be met and not met as teams keep battling for divisional positioning all in the hopes of holding onto or grabbing onto a playoff qualifying position. Who will be left standing when all is said and done? Will any teams manage to pull off a last minute upset to steal playoff berths? Who will miss the playoffs in shocking fashion and who makes their playoff comeback? Time will tell who will be left standing when the dust settles before the storm that is the NHL playoffs begins. As for the Vancouver Canucks, despite an insane injury bug that came calling in early 2015, they are once again playing meaningful games in March. Meaningful games being played by the Vancouver Canucks in March! That feels good to write…who would have thought after the torpedo that was their 2013-2014 season under Torts, that they could be capable of a quick turnaround?! Or perhaps when the injuries began to pile up between January and February, any hopes that were once sparked have turned into doubts? Or perhaps you were of the cautiously optimistic variety? This season could not be more different from last season despite a massive injury pile up. For much of January and February the Canucks had a myriad of different players being asked to step up game after game due to the ever growing list of injuries. Somehow they found ways to win games despite a depleted lineup giving themselves an opportunity to go on a stretch drive run for March madness and an April tuneup. March madness indeed! 21 games in March and early April with a near healthy lineup for the first time since the start of the season. Divisional rivals and wildcard holders trying to keep pace with the Canucks or even potentially pass them in the standings. Every game has playoff implications. Every game will dictate where the team stands when all is said and done after 82 games. As they have done all year, they have won games they should, they won games that were considered impossible and lost games they presumably should have won. Through 11 games in March, they have amassed a 7-3-1 record (15 points) to help them maintain second place in the tight Pacific Division. These final ten games will set the tone for the post-season should the Canucks earn a playoff berth. One thing is certain, that no matter what situation the Canucks find themselves in after the final buzzer on April 11th, this team is slowly beginning to turn THIS city into BO-lievers once more! 72 games down, 10 games to go. Playoffs looming and anticipation of what could be grows with each victory. March Madness will soon be followed by the April rush that sets up the ever exciting race for Stanley. It’s been a few weeks since I last posted a blog, but I promise, I did not disappear. A heavy work schedule and a few days off for Christmas kept me away. I’m back and ready, so let’s get back to work, shall we? Talk hockey to me! Last season the Canucks had a December to remember posting a 10-1-2 record and the month that followed was when everything began to unravel. This season, December has not exactly been THAT memorable save a 5-game losing streak but perhaps that could be a good thing. Last year in December, it seemed like THIS team was capable of greatness and then the chain of everything that could go wrong, did go wrong when the new year began. Yes, the Canucks have had their struggles THIS December…but they also have something that they did not before last year’s 33 game mark: 20 wins and instead of focusing on their individual bests, they are working together as a TEAM. Scoring on any given night is being done by committee. Can you recall a time in recent Canucks history when scoring was somewhat balanced? It feels like it has been a long while. They are not solely relying on the Sedins every single night but rather EACH line is contributing. 33 games in and as has been said many times this season, we have seen a little bit of everything from the good, to the bad and everything in between. First goals, milestones reached, back to back shutouts, games won, games lost, overtime glee and overtime heartbreak. Lots of little and big moments that have yet to be seen as the team has 49 more games to leave their mark on the season at hand. As they return from holidays, the Canucks will have to be ready to play their best with a trio of games versus the Californias. It will not be an easy task for the team but they are proving to be competitive within their division with an impressive 9-2-1 record through 12 games. 33 games in and despite a few lopsided losses, THIS team has evoked hope in a way that never seemed to happen last season even when they were playing well. This team still has work to do in the remaining 49 games to prove that they are in fact playoff contenders but they are off to a good start in working towards that aim. 33 games down, 49 more to go before all is said and done and it all begins tomorrow when the puck drops in Anaheim. The Canucks will look to build upon the momentum of their two-game win streak they took into the holiday break. Keep your eyes on these next few games, Canucks fans- Henrik Sedin’s next goal will be his 200th career goal.